For full flavor, commit to cooking at least 90 minutes, then top with sour cream, avocado, scallions or cheese. 1. In a large saucepan, heat the oil over medium heat. Add the cumin seeds and cook until fragrant, about 30 seconds. 2. Add the onion and bell peppers and cook, stirring occasionally, until softened, about 10 minutes. 3. Add the garlic and cook for about 1 minute, until aromatic. Add the mushrooms, cover and cook until the mushrooms release their liquid, about 5 minutes, lifting the lid to stir a couple of times. Then cook until the liquid released by the mushrooms has been absorbed, about 5 minutes more. 4. Add the tomato paste and cook for 1 minute. Stir in the chili powder and chipotle and cook, stirring often, until aromatic, adding a tiny bit of water if the mixture starts to stick. 5. Add the vinegar and stir to release any bits stuck to the bottom of the pan. Add the coffee and cook until it has been almost completely absorbed, about 5 minutes. Add the cocoa powder, beans, whole tomatoes (crushing them in with your hands) and their juices, the salt and broth. 6. Bring to a simmer, then partially cover, reduce the heat to low and cook for about 1 1/2 hours, until the chili is a bit thickened but still a little soupy. 7. Add the corn and cook until just cooked through, about 5 minutes. Turn off the heat and stir in the cilantro. 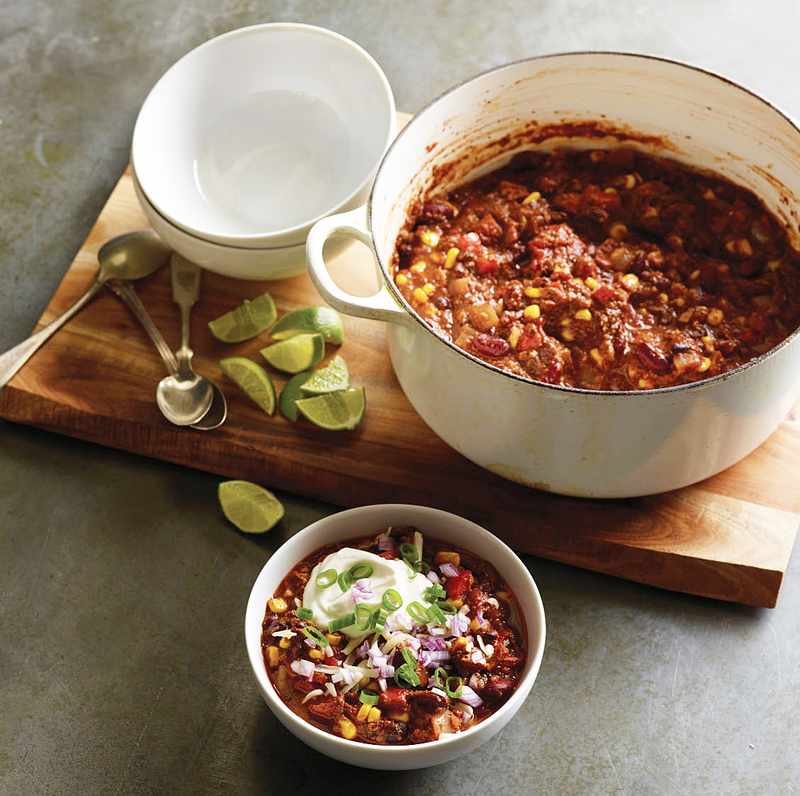 If you’ve got a half hour to spare, let the chili sit to further develop the flavors and thicken. Taste and add more salt and/or an additional splash of vinegar and serve with your choice of garnishes. 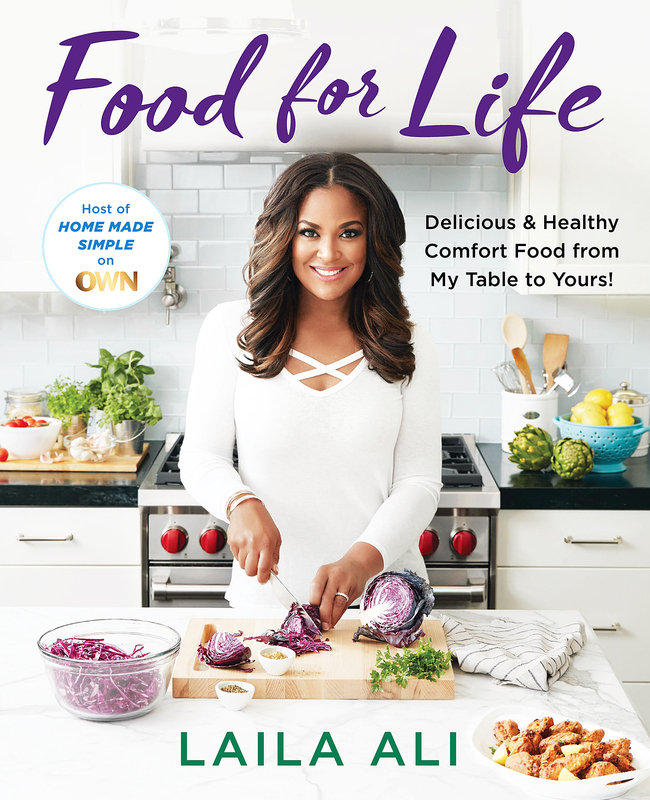 From Food for Life by Laila Ali. Copyright © 2018 by the author and reprinted by permission of St Martin’s Press.